Beautiful blue lab opal wedding ring handcrafted in sterling silver by Hileman. 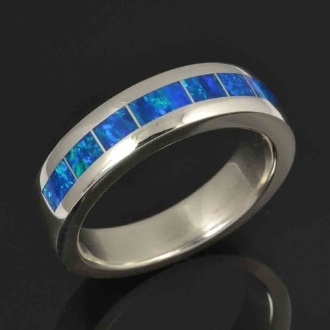 This unique wedding band is inlaid with seven sections of lab created opal. The opal is a deep blue base color with flashes of bright greens and blues. It is actually even better than the photo can show! This ring is about 6mm wide and is shown in a size 10 for scale. The wedding ring is hand signed "MMH" by Mark McBride Hileman on the inside and stamped sterling silver. Many customers have chosen to wear this style ring as a wedding band or man's engagement ring. Please allow 3 to 6 weeks for us to make the ring in your ring size. This ring is also available in other lab opal colors or inlay materials as well as 14k white or yellow gold for an additional charge. This ring is style #M200ssBLabOpal. The lab created opal in this ring is a top quality synthetic opal grown under laboratory conditions. The manmade opal's chemical composition is the same as natural opal with the exception of water content. Australian opal contains about 4% water and lab created opal contains no water. Instead the water is replaced with resin. The resin gives the synthetic opal more durability and helps to resist cracking. Laboratory grown opal gives you all the fire and colors of top grade natural opal at a much more affordable price with increased durability.